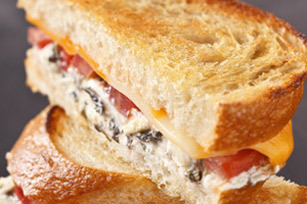 Add this Spinach-Artichoke Grilled Cheese Sandwich to your weekend lunch repertoire. Our spinach-artichoke grilled cheese features a cream cheese spread. Mix cream cheese spread, spinach and artichokes until blended. Spread 4 bread slices with cream cheese mixture; top with remaining ingredients. Cover with remaining bread slices. Cook, in batches if necessary, in large skillet sprayed with cooking spray on medium heat 2 to 3 min. on each side or until cheese is melted and sandwiches are golden brown on both sides. Prepare using KRAFT Provolone Cheese Slices, and substituting 2 Tbsp. roasted red pepper strips for the tomatoes.